Another excellent solo recording by the Dublin piper whose music, through his father fiddle player Tom Mulligan, is rooted in the Leitrim tradition. 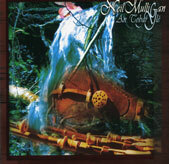 This is Neil Mulligan's third album, after "Barr na Cuille" and "The Leitrim Thrush," and like on those, the piping, on instruments pitched at C# and D, is unaccompanied. Mulligan tackles some of the great piping tunes, "The Gold Ring," "The Blackbird," "Colonel Frazer," the latter being preceded by a lovely rendition of the famous James Ennis reel "The Morning Thrush." Slow airs, including "A Stor Mo Chroi" and "Taimse im' Chodladh," are given a fair share as well. The last two tracks are home-made recordings of Mulligan playing with his late father Tom, and what they lack in sound quality is easily made up by how privileged one feels to be given a front-row seat to such an intimate moment.